Sealmaster, Inc. | Servicing Entire Chicagoland, parts of Michigan Indiana and Wisconsin. Never worry about a stain again. Recommended by professionals including architects & designers for over 25 years! Sealmaster is honored to be Chicagoland's most trusted fiber protection company for cleaning, sealing and spot cleaning of carpeting, upholstered furniture and fabric wallcoverings. Based in Northbrook, Illinois, Sealmaster services the entire Chicago metropolitan area including Northern Illinois, Southern Wisconsin, Northwest Indiana & Southern Florida. Contact us today to speak with our fabric protection experts! Call 847-480-SEAL (7325). Everyone was an absolute pleasure to deal with. – Audrey Gaynor & Associates. Sealmaster, Incorporated’s proprietary sealant is the highest grade fiber protection available for upholstered furniture, carpeting, and upholstered fabric walls. Call 847-480-SEAL (-7325) to learn how we can help you preserve the beautiful look of your furnishings in your home or office. Sealmaster, Inc. prides itself on utilizing the best methods and solutions while cleaning your home or office furnishings. We work on the finest fabrics manufactured worldwide. Let us discuss an appropriate maintenance schedule with you. Sealmaster, Inc. will help you preserve the fresh look of your outdoor furniture by cleaning and sanitizing the fabric cushions on a yearly basis. We can also provide fabric protection and storage for the cushions, as well. Sealmaster, Inc. is known for the leading protective sealant in the industry. Sealmaster's worry-free service helps you care for all of the soft surfaces in your home, including wall-to-wall carpeting, area rugs, upholstered walls, and upholstered furnishings. As a "customizer of sealants," Sealmaster can meet the needs of its clients; along with determine the proper treatment for the fiber composition of the carpeting or fabric. Sealmaster works with a chemist to be sure that all products used are compliant with government regulations. Simply said, a protective sealant is composed of two parts- a carrier and a polymer. The carrier's job is to bring the polymer to the fiber and help it spread. The polymer stays behind and offers resistance to permanent staining. Not all sealants are created the same, though. The wrong carrier can cause damage to the fabric, either by crushing it or causing discoloration. Call 847-480-SEAL (7325). A trained consultant will visit your home or business and discuss your needs with you, free of charge. Upon approval, we will schedule the work to be completed at a time convenient for you by one of our trained technicians. The worry-free service which provides protection and maintenance for all carpeting and upholstered furniture in your home and place of business. These services allow you complete freedom to select most any fabric or fiber, no matter how fragile! Fabric testing services are available. Because unlike other companies who use only one sealant to treat all materials, Sealmaster customizes each treatment. We accomplish this by matching the proper sealant to the needs of the individual fibers and situations. After testing for color-fastness and performing any necessary pre-spotting, the customized sealant is sprayed on by our bonded technicians who are experts in carpet and upholstery maintenance. The sealant penetrates and protects every fiber, thus resulting in longer life and durability. WHAT KINDS OF PRODUCTS ARE USED? Protection is also available for wallcoverings and window treatments, automobiles, pleasure craft, recreational vehicles and motor homes. Yes! Sealmaster provides the finest in both steam cleaning and dry cleaning services, utilizing the latest techniques to create healthy, fresh surroundings in your home. WHAT IF A DIFFICULT SPOT OCCURS? Your Sealmaster personalized service includes one free spot call per item (individual or grouped) during a twelve month period. A technician will examine the problem area to determine the safest method for correcting the problem. It's easy! Make just one phone call to (847)480-SEAL and we'll do the rest! A consultant will meet with you in your home to discuss your needs and give you a free estimate for service. An appointment is then made with one of our uniformed, photo-identified technicians to service the designated areas. The procedure is completed in a short time...drying time is anywhere from 15 minutes to 3 hours. You then have the satisfaction of knowing your carpets and upholstered furniture have been protected from oil, dirt and water! DO YOU CLEAN OUTDOOR CUSHIONS? Yes! Sealmaster can clean up your dirty outdoor patio cushions and store them for the winter in our temperature controlled facility. Call us as you are ready to close down the patio for the season. Proper cleaning and sealing of your outdoor cushions can increase the longevity of the fabric. Stains and soil are more easily removed when cared for on a regular basis. Sealmaster, Inc. can safely kill unwanted mold, as well. Once your cushions are beautiful again, you have the option to apply our top-grade protective sealant to the fabric. We are here to help you arrange pick-up and delivery of your cushions. Storage is available if desired. Hannah Malin founded Sealmaster, Inc. in 1987. For over 25 years, Sealmaster has set industry standards for high quality products, backed by superior service and knowledge. With a strong mind for business, and a passion to provide the same type of quality service she would appreciate in her own home, Malin set out to "save Chicago" from stains and spots on the beautiful furnishings everywhere. Malin started in the business of fiber protection over 30 years ago. She has always surrounded herself with the best professionals in the industry in order to learn, and continue learning, about how to care for the exquisite fabrics presented to her. Not only does she continue to educate herself on new fabrics and technologies available, but she shares that knowledge with many premier showrooms in Chicago's Merchandise Mart, as well as the high-end interior designers and architects that refer her company daily. Malin has dealt with all hurdles in business with a strong head and a full heart. Growing up the daughter of a door-to-door salesman, she learned the value of hard work and persistence. She has kept up with the changes in the chemical world, all while keeping the quality of the products top-notch. She strives to provide quality service that she can be excited about every day. She is proud of her staff that also takes pride in "going the extra mile" for the client, and offering personal assistance to each situation in front of them. When not saving the world from spots and spills, Hannah enjoys spending time with her two children, their spouses, and her five grandchildren. They are truly the pride and joy of her life. Lisa Greenberg, Hannah's daughter, joined her mother's business in 1994. A recent graduate of Washington University in St. Louis, Lisa wanted to use her business and psychology backgrounds to help her mother grow the business. When Lisa first joined the business, she dove in "head first" to gain as much knowledge of the industry as possible. Lisa attended classes and seminars nationwide, as well as gained "hands on" experience to learn. Lisa is known as an industry expert on fiber technology after attending classes to become a Certified Fabric Specialist. Lisa uses her extensive knowledge to act as an advisor for designers and architects on fabric selection and durability. She also works closely with chemical companies throughout the country to be sure that the solutions we use in your home or business are the most effective and safe available. Lisa is the proud, and busy, mom of three fabulous girls. They love baking, traveling, and making messes together. Don't just protect it... SEAL IT. NORTHBROOK, IL–Mar. 26, 1998–Eleven years ago, Hannah Malin left a job as a sales consultant with a fabric care franchise and decided to try to outclean her former employer. She hired a chemist to develop a series of sealants that could be applied to carpets and upholstery to provide an invisible barrier against stains, and she launched one of the few businesses in the city dedicated to providing “insurance” against fabric damage. Today, Malin’s Sealmaster is the leading fiber protection company in the Chicago area, with customers ranging from residents of the Magnificent Mile to hospitals, law firms and corporations. Most of the showrooms in the Merchandise Mart as well as the city’s leading interior designers recommend Sealmaster to protect their clients’ furnishings. And the company’s services have rescued soft surfaces throughout the city from the assaults of everything from lipstick and pizza to untrained cats and dogs, exploding fish tanks and, in one memorable case, a spilled bottle of French salad dressing that had left a painfully conspicuous trail of orange blemishes across a brand new white carpet. "People think that store-applied sealants on their sofa or their wall-to-wall carpeting will protect them from stains, but most sealants only repel liquid and dissipate after a while," Malin says. "Our treatments resist dirt and oily substances as well as liquid. They also last longer and offer the advantage of personalized spot removal service if there is a difficult stain that you cannot remove." Applied with pressure sprayer tanks similar to those used by exterminator services to ensure even coverage, Sealmaster's proprietary sealants make stains easier to remove by reducing fabric absorbancy. In one vivid demonstration of the treatments' effectiveness, Sealmaster sprayed one area of a school's carpeting with its sealants, left another area protected only by the carpet manufacturer's commercial stain barrier, and then bombarded both sides with months' worth of glue, whiteout, markers, coffee, soda pop, cookies and other school dirt makers. The side sealed with Sealmaster's process came dramatically cleaner, with less effort, than the commercially sealed portion. Sometimes, the results surprise even Malin. Case in point: a five-inch circle of red ink spilled on a client's cream-colored wool carpeting. "We told him it probably wouldn't come out, even though the carpet was sealed," Malin recalls. "But after our technicians worked on it, it was barely noticeable. 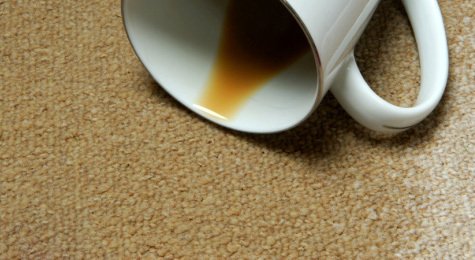 Without our treatment, the carpet would have been ruined." Malin is a former elementary school teacher whose first business venture was a hot dog stand that she owned with her husband in the mid 1970s. In 1979, seeking a new challenge she took a sales job with a fabric care company that combined her natural talent with her interest in design. "I grew up in a very small house on Chicago's North Side, and I used to look at the tall buildings on the Outer Drive and wonder who lived there," Malin recalled. "Suddenly, here I was in the city's penthouses, and I had the opportunity to see the work of Chicago's most influential designers. That's when I knew I had found my niche." As a result, when the time came to move on, she decided to stay in the industry. Joined by several co-workers, including chief spotter Les Brissette, she opened her own fabric care business in 1987. Within six weeks, she had snared a contract to seal and maintain the carpeting and upholstered furniture in the professional suite areas of Rush Presbyterian St. Luke's Hospital. Since those early days, Sealmaster has expanded its treatments from carpets and upholstery to wallcoverings and window treatments, cars, boats, RVs and motor homes. In addition to sealing, spotting and cleaning services, the company offers antimicrobial treatment that kills bacteria and sunblock treatment that resists fading from bright sunlight. Each treatment is customized to match the proper sealant to the needs of the specific fibers and situations. After treatment, the company leaves the customer with special spot removers designed specifically to work with the sealants for do-it-yourself cleanups. Malin now has a staff of 15, including eight full-time technicians, and her own building in Northbrook's Sky Harbor industrial park. Her husband handles the financial end of the business, and their daughter, Lisa, joined the firm after graduating from college four years ago. "Most people use our sealing services because they'd rather pay for an annual treatment than replace 2,500 square feet of carpeting prematurely," Malin says. "With the high price of furnishings today, this is a service that fills a need in the marketplace, and that is the reason for our success." Servicing the entire Chicagoland metro area, including areas of Illinois, Indiana, and Wisconsin.